Learn how to make ricotta cheese at home in just 5 minutes and with just three simple ingredients you probably already have on hand. 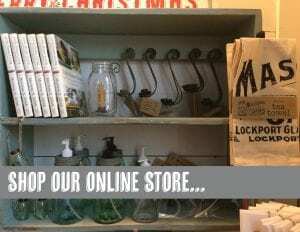 You’ll never buy store-bought again! 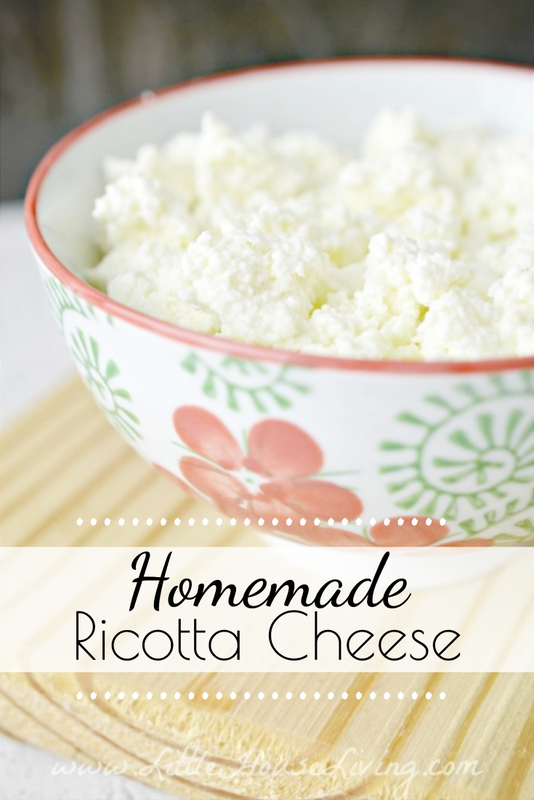 Ricotta Cheese is one of those things you should never need to buy from the store. Why? Because it’s just so easy and so cheap to make at home! Yes, I realize this recipe isn’t for “traditional” Ricotta Cheese (made from whey), but it’s a perfect homemade ricotta cheese recipe when you need a frugal and quick substitute in a recipe. Once you learn how to make Ricotta Cheese, you will see that it takes just 5 minutes of prep time and uses ingredients you probably already have on hand, so there’s no need to make a trip to the store and no need to spend more money. Quick, easy, frugal…What’s not to love? In this quick recipe for homemade ricotta cheese, you start by heating some whole milk and a pinch of salt over the stove and then add a little vinegar to make the milk curdle, which, in turn, creates the curds that form the basis of your cheese. Then all you need to do is strain it through some cheesecloth and you’re done! Start by prepping your draining bowl. All you need to do is stretch some cheesecloth over the edge of a bowl and secure it with a rubber band. You can buy unbleached cheesecloth in bulk on Amazon. You can occasionally find cheesecloth at the dollar store as well. Place your milk and the pinch of salt in a saucepan on the stove top. Turn the heat to medium-low and place a candy thermometer in the pan. (I have this one!) Stir occasionally until the temp reaches 165 degrees. Once the milk reaches 165 degrees, turn off the heat and add the vinegar. Give it a little stir, just enough to move around the vinegar and let the whole mixture sit for a minute or two. You’ll see the milk begin to curdle, much the same way it does when you add vinegar to milk to make homemade buttermilk. 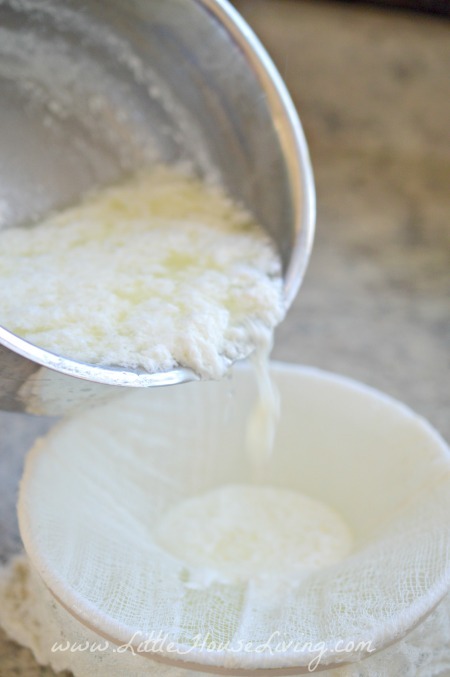 Strain the mixture through the cheesecloth into your bowl slowly and gently. Let the cheese set on the counter for about 20 to 30 minutes to drain. Once the cheese has drained you can place it in the fridge in an airtight container until ready to use or you can use it right away! This recipe makes about 1/2 cup of homemade ricotta cheese per 2 cups of milk used and will store for a few days in the fridge, but make sure to use it up within a week. Extra ricotta cheese can be frozen for later use. Of course, don’t just toss out the leftover whey! Feed it to your animals, use it in place of milk in bread recipes, or make some of my yummy Whey Cornbread. Replace the cottage cheese in this Banana Pudding Recipe with Ricotta Cheese for a smoother taste. You can use Ricotta Cheese in this Stretching a Buck Lasagna for an even more inexpensive meal. 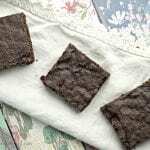 Replace the cottage cheese in my favorite Lasagna Roll Ups for a tasty treat. Now that you know how to make ricotta cheese at home, do you think you’ll ever go back to buying it from the store? I don’t think I could. Need to print out the recipe with step-by-step instructions on how to make ricotta cheese? Grab it below! 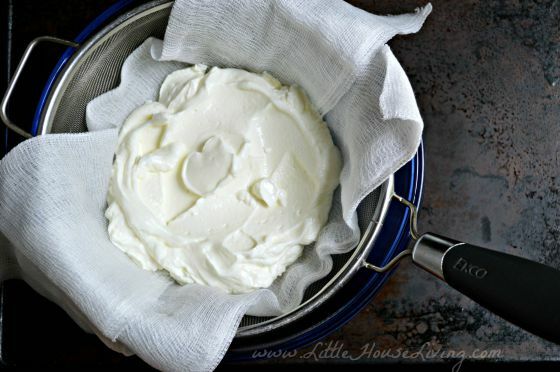 Learn how to make ricotta cheese at home in just 5 minutes and never buy it from the store again! Start by prepping your draining bowl. 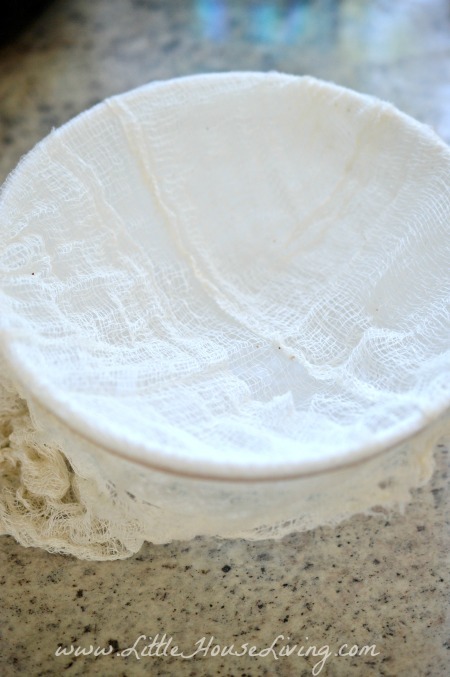 Stretch some unbleached cheesecloth over the edge of a bowl and secure it with a rubber band. Place your milk and the pinch of salt in a saucepan on the stove top. 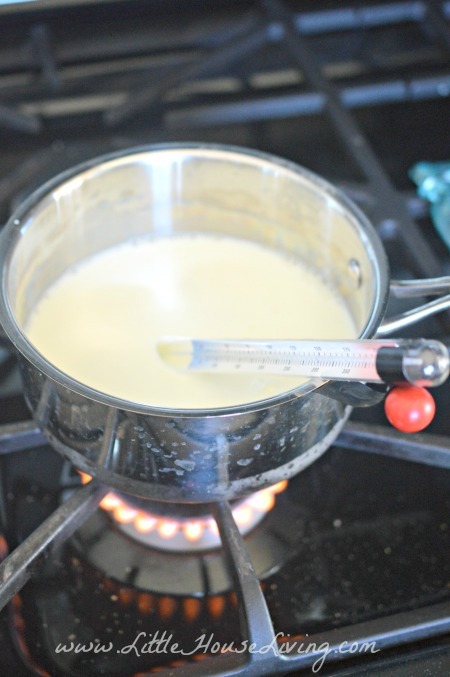 Turn the burner on a low-medium heat and place a candy thermometer in the pan. Stir occasionally until the temp reaches 165ºF. Once the milk reaches 165ºF, turn off the heat and add the vinegar. Give it one little stir, just enough to move around the vinegar and let the whole mixture sit for a minute or two. Pour the mixture into your prepared bowl slowly and gently. Once the homemade Ricotta Cheese has drained you can place it in the fridge in an airtight container until ready to use or you can use it right away! This recipe makes about 1/2 cup of homemade ricotta cheese per 2 cups of milk used and will store for a few days in the fridge, but make sure to use it up within a week. Extra homemade Ricotta Cheese can be frozen for later use. 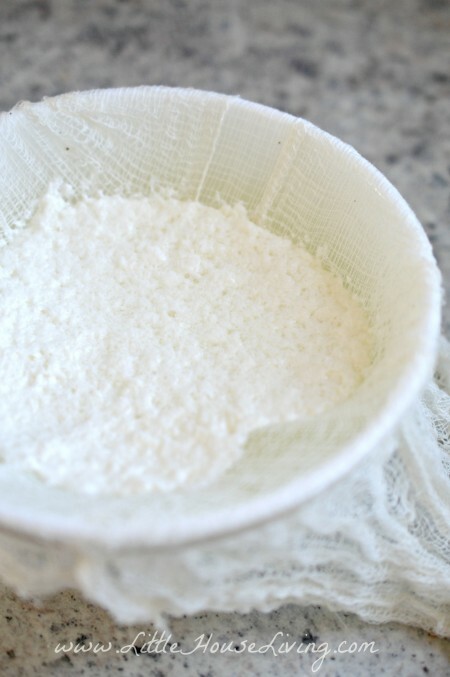 Do you know how to make Ricotta Cheese or have you ever tried making it before? 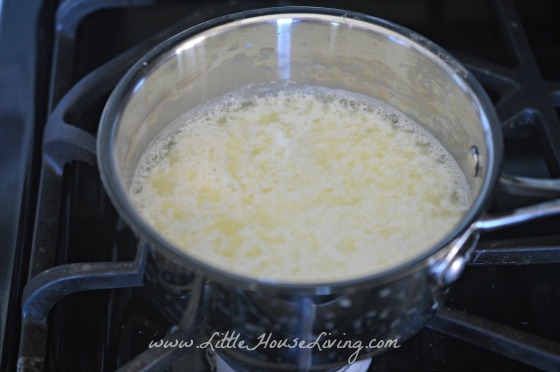 This blog post on How to Make Ricotta Cheese was originally published on Little House Living in December 2017. It has been updated as of February 2019. This will stretch my already tight budget. I see lots of lasagna in our future!!! 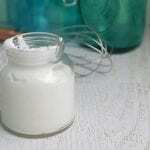 Do you know if you can use homogenized milk to make the ricotta cheese? This sounds like a very easy and simple way to make your own ricotta cheese, and I am eager to try it, but don’t have a source for raw milk where we live. No, I don’t think powdered milk would work for this recipe. Just make 2 cups worth of milk, according to the package directions. Heat as instructed above. Add vinegar & stir. LET COOL (this is where the powdered milk process differs from the fresh milk process). Then proceed with the recipe as written. I’ve made home made ricotta cheese from every kind of dairy milk–whole, skim, lactose free, powdered, instant non-fat, and even goat milk. It all turns out a little differently, but works in recipes such as lasagna. I’ve done this for years–over 30–because I don’t like paying the high price for ricotta cheese. Has anyone tried making it with just-turning-sour whole milk? Sure would like to use up what I have now. Thanks for this recipe! I’m excited to try it. I had wanted to make lasagne the other night but didn’t have any ricotta and our budget is really tight right now but I have all of these ingredients! 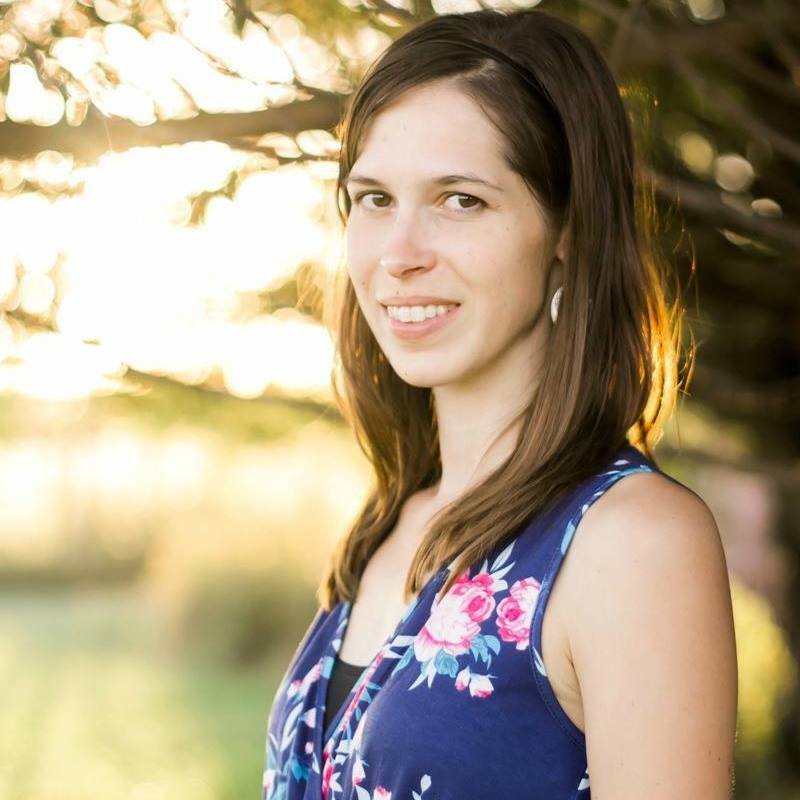 Hi Laura, here’s a link to the Kettle Corn Recipe. Enjoy! Why not? I lost power during storm for three dats. Combined all my warmed and sour milk and made ricotta. Used it in lasagna. Perfect! 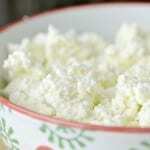 This is a great tip and an easy and inexpensive way to add ricotta to recipes instead of cottage cheese. 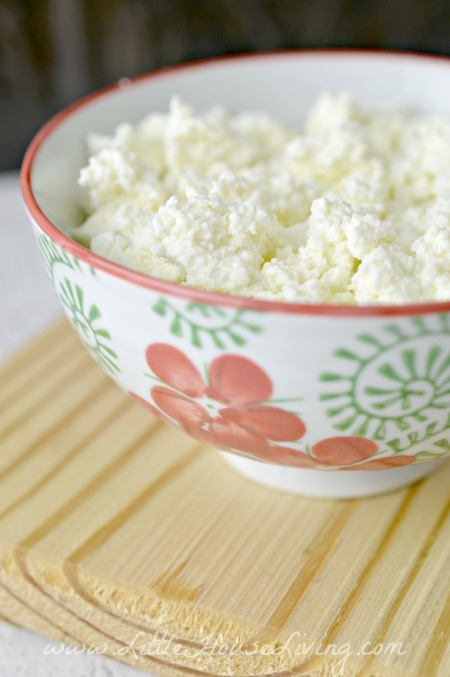 I never feel that cottage cheese is a good replacement for ricotta in italian dishes. Once you try your favorite italian dishes with ricotta instead you will taste the difference. I have made ricotta before but the recipe I have calls for cream with it. I will definitely try yours because the cream makes it much more expensive and YES I just use whole milk from the grocery store. Is there a detectable difference in flavor from the store bought ricotta? I have an Italian family and I am wondering if I could if I could pull this off! It should be very similar if you use whole milk. It is funny that we get so used to going to the store and buying certain things that we forget the way that our ancestors used to get their things (they made them). Oh that “stuff” in the cartons they call ricotta at the large chain grocery stores is the most disgusting thing to me, an “old” Italian from the old neighborhood “Taylor Street” area in Chicago. Your cheese is so beautiful! I can’t wait to try making ricotta with cow milk – but it’s going to be a while before our heifer breeds and freshens. This is very similar to the way we make panir cheese with goat milk. It’s heated to a higher temperature though, so it’s dryer, and we shape it into logs, roll in herbs, and slice it for cheese and crackers. Yum! Could this be done with raw cow’s milk? Will you share your recipe please? This looks very interesting. And i want to start living a more simple life and be less of a consumer. My only concern here is this, does the vinegar or lemon juice affect the favor at all? Does it sour the final product? If not, then i would enjoy giving it a try. 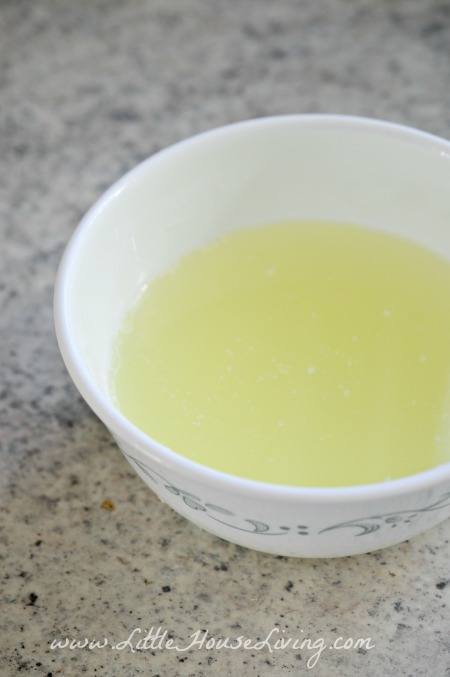 If you are concerned about a little residual flavor from the vinegar you can rinse the ricotta when you are done, although you will have a slightly drier final product. I always watch my calorie count. Do you know how many calories is in a 1/2 cup. .
Could the whey that is a by-product of this recipe by used to make ricotta by the more traditional method? Can you freeze this and if so, for how long? I have not tried freezing this recipe. I don’t think it would turn out well because the texture will change during the freezing process. Although made similar to cottage cheese this recipe is not cottage cheese. 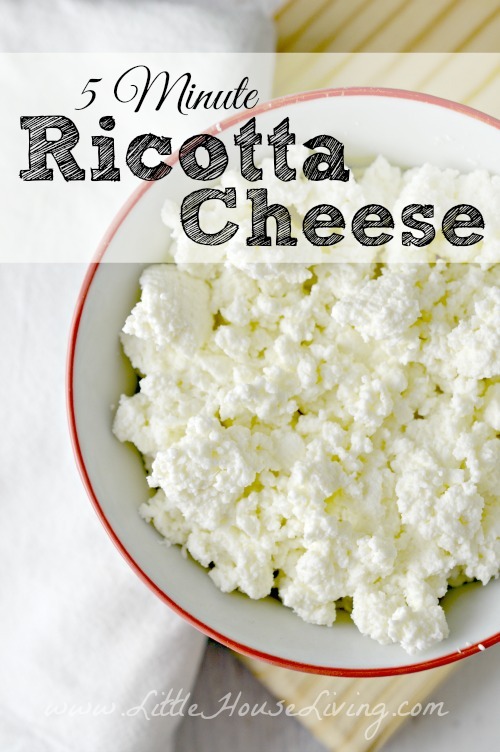 It tastes and acts just as ricotta cheese in a recipe because of the texture therefore even though it’s not made in the same process as “traditional ricotta cheese” it’s much closer to ricotta cheese than cottage cheese as far as using it in a recipe goes. Wow, just wow, made this a few days ago. I have been thinking about making ricotta for months, after making this recipe and seeing how easy it is, I’m going to be making so much more ricotta. Great job! This may be a stupid question, but is it 165F? Mine had little orange-ish brown pieces…. Is this from scalding? I like the texture but it had very little flavor. Can I add herbs and maybe some garlic powder for flavor? At what step would you suggest should I add flavorings? Thanks so much! Yes, it should get to 165 degrees Fahrenheit. The brown pieces could possibly be from scalding, perhaps from not stirring enough or turning up the heat too high? Ricotta isn’t a very flavorful type of cheese, you could add in flavorings after you’ve separated the whey if you plan on eating it plain. Sooo… not really five minutes. I really want to try this. Wonderful instructions, lovely pictures. I know it is just what I’ve been looking for. But… I don’t have a laptop, I have a desktop, so no access to the recipe while in my kitchen, and I can’t print it nor copy it to print it in Word. Can you help me out here? I really really do want to do this. We are in the process of updating old posts to see that they are easy to print, for now, just click the green “Print Friendly” button at the bottom of the article and select only the text you want to print.